A Piedmont town wakes up early to restore a piece of community history. The first meal of the day shouldn’t be a burden. Then again, it shouldn’t come straight out of a box, either. Breakfast — a real breakfast — should be equal parts ease and effort. 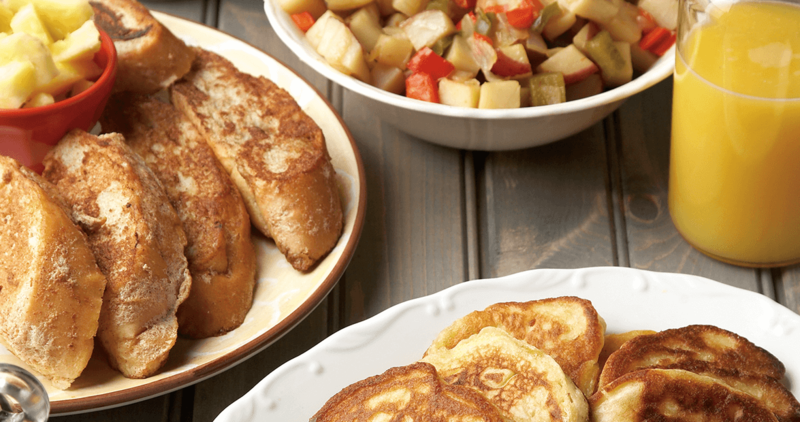 Take Debra Mays’s buttermilk pancakes, for example. Before they’re served golden brown, topped with butter, and smothered in syrup, the pancakes start with a recipe. The first instruction is to separate three eggs. The recipe then goes on to say: whip, stir, blend, fold, and flip. Before you can eat these pancakes, you have to do a little work. But it’s not hard work. Almost all of the ingredients should be in your pantry (you’ll probably only need to buy buttermilk). And the instructions are simple and clear, like most of the recipes in Dinner on the Grounds, a cookbook from the Preservation Oak Ridge Foundation. The members of that group are the ones doing the hard work. They assembled the thick, 244-page cookbook as part of an effort to raise money to restore a historic, turn-of-the-century church. Little by little, they’re rehabilitating what once was an eyesore. They often hold workdays on Saturdays, when they get up early and keep at it all day. This commitment requires some sacrifices. But if enough people pitch in, they say, the work isn’t so bad. And it’s not without its reward — everyone notices the church. The church and the sign show passersby that people in this community care. The landmarks are like Debra Mays’s pancakes in that sense. Because if you put effort into a process, whether a lot or a little, it usually yields something worthwhile.